The extensive use of glass in our homes makes it relatively easy for burglars to smash or cut their way in. However, you can make it difficult for them to remove your belongings if you install dead-bolts on external doors and keyed locks on all the windows. Unless the burglars can locate the keys, they can’t open anything and are forced to clamber out through a window edged with broken glass. Putting locks on timber windows is relatively easy; it may even reduce your insurance premiums and, better still, may considerably reduce the likelihood of burglary. Purchase a system with a single master key. 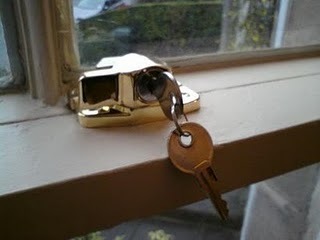 Keep the key in a secure, secret spot. Locks featuring one-way screws are the easiest to install, a one-way screw can be screwed in but can’t be screwed out. Establish what type of timber window you have. A timber window consists a number of sashes (the frames that hold the glass) which are fixed by a variety of fittings to an outside frame. These sashes will be either horizontally or vertically sliding; casement (opening outward from the side); awning (opening outward at the bottom); or hopper (opening outward at the top). Make sure the type and number of locks you select will suit your windows. If you’re unsure, ask at your hardware store. boleh juga niih untuk keamanan dari para pencuri, tapi yang paling penting mah kita harus tetap WASPADA.... pencuri selalu mengintai di sekitar kita. This is a good idea. We have window locks as well as window grilles. Great post.